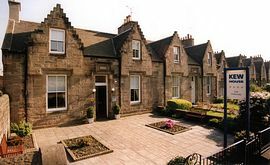 Kew House and its adjacent serviced apartment offers stylish and contemporary accommodation in Edinburgh City. 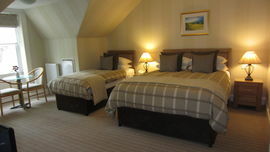 Parking is secure and included, as is broadband Internet access with Wi-Fi to all bedrooms. 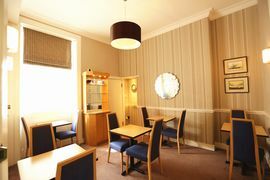 Breakfast with an extensive choice is included in the rate at Kew House with a Continental breakfast in the apartments. 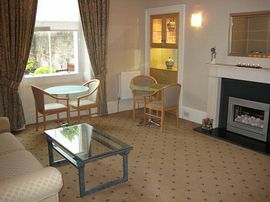 Easy walking distance to City Centre and also on main bus route to and from the airport and city. Situated 15 minutes walk West of Princes Street and 5 minutes from Haymarket Station on the A8 route (extension of Haymarket Terrace). The main buses from city are 12/26/31, ask to leave at Kew Terrace. The number 100 airport bus stop is at Wester Coates opposite. Closest tram stop is Haymarket Station. 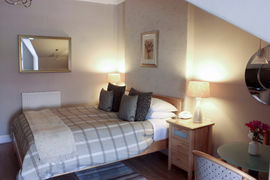 Room rates from two people are from £89.00 in Winter, £109.00 in Spring and late Autumn and from £100.00 to £175.00 in high season or special events. These are for the room including breakfast and VAT. Check-in from 14.00 until 22.00 unless by arrangement. Check-out time is 11.00. AA 5 Star Gold, Michelin, Fodors, Frommers recommended.